A Morton’s neuroma, also referred to as an intermetatarsal neuroma, is a swollen, inflamed nerve that appears in the ball of the foot between the metatarsal bones, which are located at the base of the toes. Typically, these neuromas develop between the third and fourth toes. The condition produces persistent pain in the ball of the foot. There are different types of neuromas that may develop in the foot, but a Morton’s neuroma is the most common. A Morton’s neuroma occurs due to continual compression of the nerve between the metatarsal bones, which results in inflammation and swelling. Most often, ill-fitting shoes that bind the forefoot cause this condition. What are the symptoms of a Morton’s neuroma? The pain may cause you to walk with a limp or minimize the time spent on your feet due to the discomfort it causes. What are the risk factors for a Morton’s neuroma? What are the treatment options for a Morton’s neuroma? If you are experiencing persistent pain in the ball of your foot, call our office at 212‑434‑4920 or fill out the schedule appointment form on this page to get a proper diagnosis before your symptoms worsen. A Morton’s neuroma is fully treatable without surgery for most patients and treatment outcomes are significantly improved if medical evaluation is sought when symptoms first start. Nonsurgical treatment options may take several months to fully take effect, depending on which course(s) of treatment you take and how long you were experiencing pain prior to seeking medical attention. The first and most important step to recovery is stopping or reducing all activities that make the pain worse, particularly those activities that place repetitive pressure on the neuroma. Applying ice to the affected area will help reduce pain and swelling. Trade out tight shoes and high heels for wider shoes with soft, supportive soles. A wider foot bed and comfortable insole will allow the injured foot to spread out, reducing pressure on the nerve and allowing it to heal. Inserts placed in the shoes can help relieve pain and swelling by repositioning the foot and reducing pressure on the neuroma. If conservative treatment options do not relieve symptoms after several months, Stuart Katchis, M.D. may recommend foot neuroma surgery. 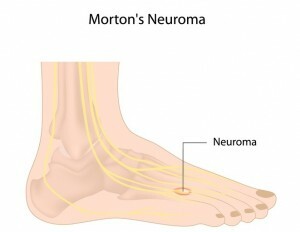 The surgery for Morton’s neuroma typically involves the foot and ankle surgeon resecting (cutting out) a portion of the inflamed nerve or releasing the tissue around the nerve. Recovery times will vary depending on the severity of each patient’s condition. Whether you undergo nonsurgical or surgical treatment for your foot neuroma, Dr. Katchis will provide recommendations for long-term measures designed to keep your symptoms from returning, such as footwear modifications and stopping activities that place repetitive pressure on the foot.